"THIS IS FANTASTIC!. 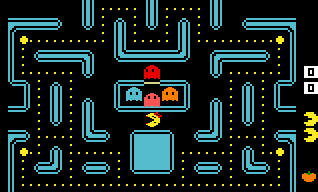 … this is probably the best, pure arcade-style game for the system." 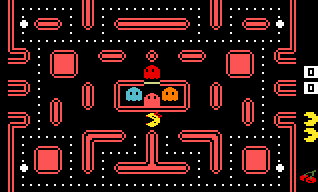 Select from 3 playable characters – Ms. Pac-Man, Pac-Man, or Pac-Man Jr. – each with different strengths and weaknesses! All three intermissions from the arcade, as cute and fun as ever! Robust options screen, offering endless game-variations and replay value! Four different maze themes, offering up to 24 screens and 24 food items in all! Your personal information is encoded into the ROM, and can be traced back to you. Distribution of the ROM will decrease the likelihood of future ROM releases. Intelligentvision is not affiliated with Intellivision Productions, Inc.
You can check with Intellivision.us; they may still have a few copies available! Thanks! You can download the ROM for free above; it is included in the source. If you want a physical copy, I recommend contacting David Harley (of Intellivision.us) to see if he has any remaining copies. It's possible! Just digging back into Intellivision after 30 years, can't believe there's such a robust community! I'm trying to play the free Ms Pac download on jzintv via retropie, but it won't boot the rom nor the bin/cfg (just getting a black screen). I have successfully played many other games, but it looks like they're all ".int" files, some with accompanying .cfg. Sorry to ask for support on a free download, but I'm stuck and thought you would want to know. jzintv should work, providing you have the latest "development version". Check the author's download page and try again. Thanks for the quick reply. I'll check it out this evening. I set up RetroPie olny a few months ago, v3.4. Not sure I know how to update jzintv only, but I'll check it out. Gotta play this! Got it working with help from the new RetroPie UK forum. Had to manually update some folders and files, can't do it using RetroPie's intergrated update setup ("Manage Packages"). Super fun version of Ms. Pac with all of the new options. Tweeted about it this morning, will continue to talk about it as I dig in more. Nice work, and thanks. Looks like a very nice version of the original port. I'm trying to play it on the JZintv GUI but when loading, the screen stays black, and nothing loads, yet the other included test roms work without any problems. Can somebody please suggest a link to get this fixed, thanks. The game looks fantastic. 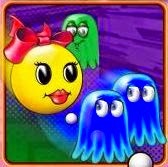 Is there any way to change the sounds to be more like that of the actual Ms. Pac-Man, and not based off Namco's console and handheld releases?